Cinara aphids are large brown to black aphids. They feed on almost all species of conifers and are found throughout North America. They are common on Virginia pine and white pine. Most of those trees are treated in the fall before harvest for this pest. But Cinara aphids on firs are rare. Cinara aphids on fir live in colonies that are often cared for by ants. Sometimes called the gypsies of the insect world, they move from tree to tree so that insect predators can’t find them. The colonies are sometimes on the tree top where the grower can see them and treat affected trees. Unfortunately, in the fall they are more often hidden on branches down inside the tree. Aphids remain in trees when the trees are cut. When the tree is moved to warmer locations, the aphids start reproducing – having live young. Numbers can build rapidly in the house! If you are used to seeing aphids on garden or landscape plants such as roses, you might be surprised by the appearance of Cinara aphids. They are much larger and brown to black. 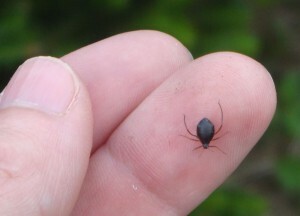 Many people have mistaken Cinara aphids for ticks. Even pesticide applicators have done so in the past. Ticks have never been found on Christmas trees at any time of year in western North Carolina and it’s simple to tell them apart. Aphids have 6 legs. They are true insects. Aphids feed on plants. Cinara aphids won’t feed on your house plants. Aphids do not carry diseases. Aphids may be present as nymphs or adults. Eggs are extremely rare. Adult ticks have 8 legs. They are a member of the spider family. Ticks may carry diseases to people and pets. Ticks have not been found on Christmas trees in North Carolina. The spruce spider mite is a common pest of Fraser fir in western North Carolina. Growers commonly scout for and control this pest. Spider mites lay eggs that spend the winter on the foliage and hatch in the spring. Infrequently, when the fall is warm and dry, mites are still active when trees are cut. They continue to lay eggs and reproduce on the cut tree. Spider mites can cause small red stains on carpets, ornaments, or furnishings. Their feeding may also cause the needles to drop prematurely. Spider mites are very small. They may appear like dark-red dots when shaken out of the tree. With a magnifying lens you can see the eight legs characteristic of the adult mite. Spider mites can’t live in your house. Once the tree is removed, they will die out because there is nothing left for them to feed on. They do not bit, nor do they cause any diseases. Detecting the mite early is the best way to prevent damage to furnishings. Praying mantids are insect predators well known for their prominent front legs folded as if in prayer. Their egg cases are occasionally found on Fraser fir Christmas trees. Females lay between 200-400 eggs in the fall in a frothy liquid which hardens, sticking to the branch. Once warmed in the home, unfortunately, the eggs hatch and the tiny mantids can invade your home. Again, these insects do not bite or carry disease. If the egg case can be located, remove it from the tree and put it outside. Small mantids that have escaped can be vacuumed up or caught and released outside.